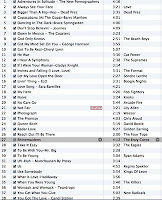 I decided this morning that I was going to compile a happy songs mix CD. I've gone through my iPod and looked at the most listened to songs, although this doesn't really count, due to playing certain playlists in the pub. But I think I've got (just about) my list of happy songs, songs that when I listen to them, I just smile from ear to ear without even thinking about it. There are 38 in total and they all get me a little excited and some of them are so very uncool but I love them, I can't help it. I'm not known as having a good taste in music, I'm known for having an eclectic taste, depending on who I'm talking with, depends on what people's views are but I don't care. They make me happy and that's all that matters. I suppose the funniest thing is, just listening to them and trying to find them on youtube, etc, has made me smile ear to ear. They are just automatic smile instigators for me. Gladys Knight and the Pips - If I Were Your Woman. Pete Townshend - Let my love open the door. I prefer Sondre Lerche's version but you've got to appreciate the original. George Harrison - Got my mind set on you. Golden Earring - Radar Love. Mr Big - To be with you. Womack & Womack - Teardrops. Bruce Springsteen - Dancing in the Dark. And the final one I'll leave you with is the song that can turn my day around (I'm not so proud of it but you can't choose these songs, they choose you) and it reminds me of being a carefree teenager. New Radicals - You get what you give. P.S. What is weird is that Queen don't feature?! They should, they really should but most of their songs represent something to me, so I guess they can't feature.